The playful bibs in this tear off pad will keep baby clean and smiling! Constructed of a waterproof disposable material, the bibs are easy to secure with seals included with the pad. It's a wonderful gift for new Grandparents -special treat bibs when little ones visit- or simply keep a set in the car to use when dinning out with baby in restaurants. 20 full color bibs to a pad –four designs with five of each style. The pad measures 9 ¼ inches x 12 ½ inches. Ages 0-3. This box is form and function to the optimal. It's based on a "stacked" design that prevents food from being tossed around, thanks to the 4 small and 1 large container that fit comfortably inside the box. Plus the lid of the box, which is super secure, is shaped to keep a bottle in place, under the elastic strap. Remove the strap and you can immerse the entire unit in soapy water or it's dishwasher safe on the top rack. This box is not just for kids, it's for anyone who likes to take lunch with them. All materials are food safe and kid-friendly: made from BPA-free and phthalate-free polypropylene safety tested for lead. Containers can be used in the microwave. Clocky gives you ONE chance to get up. If you choose to snooze, believe it or not, Clocky will jump right off your night table (up to 3 feet) and wheel around your bedroom looking for a place - far away from your bed- to hide, beeping all the while, before sounding his alarm again. And, yes, you WILL have to get out of bed to silence his alarm. The snooze time can be set from 0-9 minutes, so if you set it at "0" Clocky immediately "runs" away. If you want Clocky to be just like every other alarm clock on the block, and stay put on your night table, simply disable his wheels. Moves on wood or carpet. Easy Fold Step Stool This folding step stool is great for getting to those hard to reach places in the kitchen or closets, to help kids reach the bathroom sink or throw in the back of your RV. When not in use it folds flat and the top morphs into a convenient carry handle. 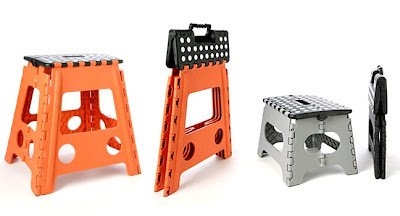 This ez fold step stool can support up to 300 pounds. Here’s a tongue in check tribute to anyone who’s ever scribbled a reminder on their hand or wrist. (Would that be JUST about everybody?) 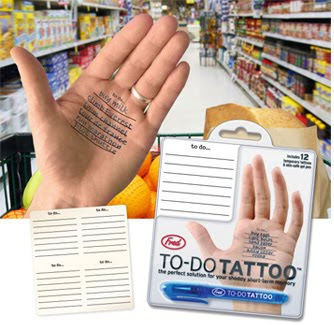 This To Do Tattoo kit includes 12 graphic “To Do” forms that you can apply to your body, wherever it’s most convenient or creative, and a skin-safe washable ink gel pen. You’ll never again have to make lame excuses for missing bowling night, forgetting your Mom’s birthday or coming home from the supermarket without the olives! Studies have shown that up to 30% of decaf coffees ordered at coffee houses and restaurants contain unacceptably high levels of caffeine, or are not decaf at all. These simple to use strips will help you determine whether your coffee or tea is really decaf. Bring the test strip in contact with a beverage sample; do not allow the D-Caf Strip to come into contact with the beverage that will be consumed – so remove a small test sample from the cup (we suggest putting some on a spoon of course), and do not consume the tested sample. Then just wait 30 seconds. If it is DECAF the strip will read as “D” line darker than “C” line, or only D line present. If it is NOT decaf the “C” line will read darker than “D” line, or only “C” line present, or lines will be equally dark. Sadly these strips won’t work on your latte, so remove the sample for testing before adding milk, or other additives. Since all decaf beverages contain a little jolt, the single-use strips will only detect caffeine above a 20 mg-to-6 oz ratio. Works with hot and cold beverages. 20 strips per package. 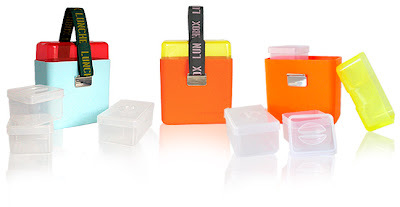 Container measures 2 ¾ inches x 1 ½ inches at its widest x 13/16 of an inch deep. Pamper yourself with Nails on Wheels! Nails on Wheels is a home service nails salon offering quality services at competitive prices. You can take an appointment online or simply call 97771230. Halloween is just around the corner and it's always fun to plan for a spooky Halloween party. 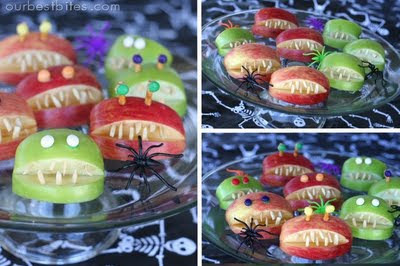 If you do celebrate Halloween, you'll love these easy and kid-friendly food ideas for your party! 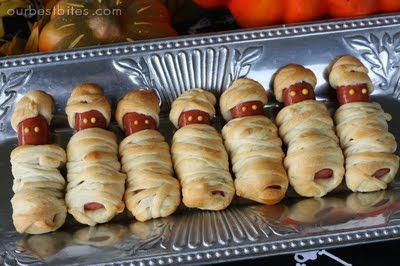 Mummy Dogs Cut crescent roll dough into thin strips and wrap around hot dogs. Bake according to crescent package directions and use ketchup or mustard for eyes. 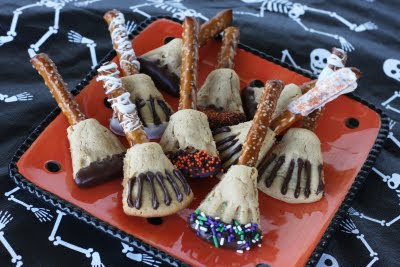 Witch Brooms Use cookie dough to form a broom shape around the end of a large pretzel rod. Use a tooth pick to make indentations in the cookies if you want. If your cookies spread too much during baking just use a knive to trim the edges when they come out of the oven and are still warm. Then decorate as desired. 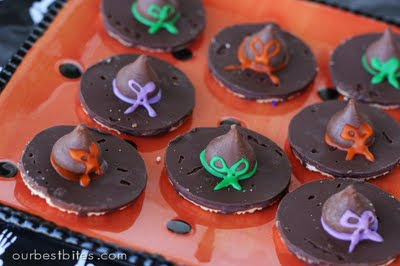 Witch Hats One of the easiest Halloween tricks (and treats!). Place a Hershey's Kiss on top of a Keebler Fudge Strip Cookie and you have a little hat. Use the little tubes of frosting you can buy in the grocery store baking isle. Pipe a ring around the outside of the bottom of the kiss and press onto the cookie. It will squeeze out and make the ring around the kiss. Then pipe on the bow. 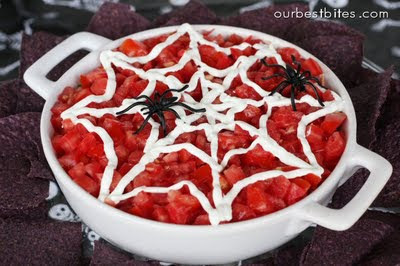 Spider Web Dip This trick works for pretty much any dip that you could pipe sour cream on top of! Put some sour cream in a plastic baggie with the end snipped off and use it to draw a web pattern. Throw on a fake spider or two and your favorite party dip is instantly creepy! 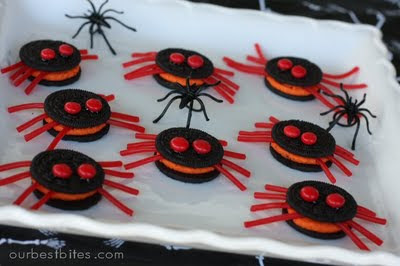 Red hots and licorice turn oreos into creepy (but kinda cute) spiders. Shoestring licorice is hard to find these days, but Twizzlers makes "Pull-Apart" candy that works perfectly. This is a great staple for a Halloween party spread because it pleases both kids and adults and is something with substance! Use Halloween cookie cutters to cut your bread. Fill some with peanut butter or cream cheese and orange-colored jam (like peach or apricot) for the kiddos, and something more sophisticated like Teriyaki Chicken Salad for the grown ups! 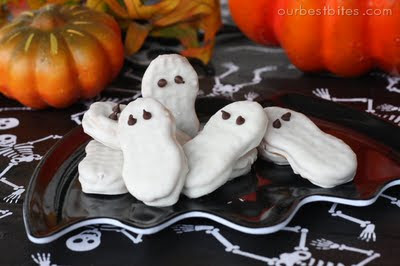 Nutter Butters are naturally ghost shaped, which make them perfect for dipping! 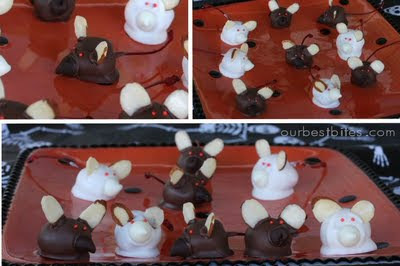 Give them a bath in some almond bark and put on a couple of mini chocolate chips for eyes. Another classic. 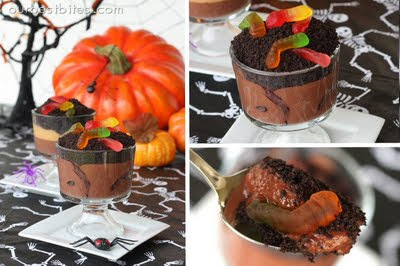 Use chocolate pudding for your mud and put some crushed oreos on top for dirt. Hide those gummy worms in there for eeek factor! You'll need marichino cherries for this one. Make sure you buy ones with stems. Drain them and dry them well with paper towells. Dip in almond bark, or chocolate bark. When they are semi dry, attach a chocolate chip for a nose, slivered almonds for ears, and little candies or sprinkles for eyes. 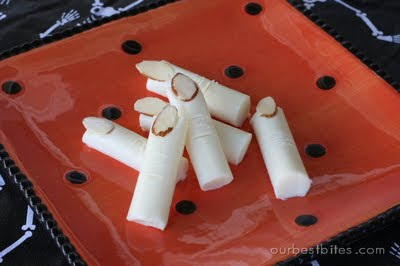 Super kid friendly- who doesn't love string cheese?? Again, I cut them in half to make them kid-sized. Use the flat side of a knife to make the knuckle marks and attach slivered almonds with a dab of cream cheese for the nails. Quarter apples and take a wedge out of the center of each quarter. Dunk them in water with a little lemon juice to prevent browning. Use slivered almonds for teeth (I toasted mine for color and taste!) Eyes are optional. What can be more soothing than a big piece of cheesecake? just imagine the smooth taste of soft and creamy cheese, the yummy crust and your favourite topping of strawberries, cherries or chocolate... addictive! 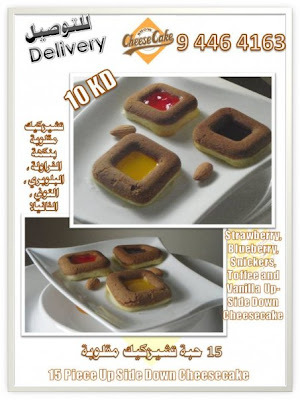 Cheesecake Show offers mouth-watering cheesecakes in different sizes, shapes and flavours. I liked the idea of the upside-down cheesecake, saving best for last! 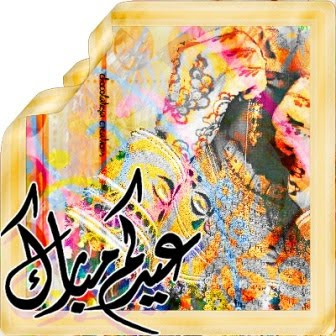 First of all, i would like to welcome all of you to my blog. The idea of this blog is really simple; it is written by a woman, about women, for women! It is all about inspiring ideas, fabulous finds and great advice.